Come and find out why the locals call us the "Top Pub". We have great value meals for a A la carte restaurant with good range of food including local produce. Special dishes of local seafood and our very popular "scotch & scallops" famous seafood chowder. We cater for groups and bus loads by arrangement. Large bar featuring items of local history and international sporting history. Our garden bar is tree-lined with ample shade. Rustic furniture sets the atmosphere. Big-screen TV. Join tourists and locals for a taste of Coromandel hospitality. Wednesday and Thursday - hot $6 lunches. Thursday - $500 bar draw. We have a range of accommodation including backpacker, campervan and country-style hotel rooms. Campervan Parks: 16 van sites. Tariff: $20 per van for two persons. Backpacker Units: 2 units catering for 6-to-8 people. Tariff: $25 per person (blankets and towels included). Hotel Rooms: country-style accommodation. 8 hotel rooms, 1 twin, 2 double, 4 single. Tariff: $50 (1 person), $ 90 (2 persons). Hotel Rooms: country-style accommodation. 8 hotel rooms, 1 twin, 2 double, 4 single. Tariff: $50 (1 person), $90 (2 persons). 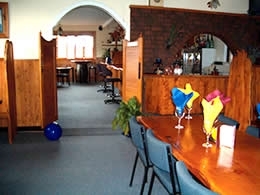 A la carte restaurant with good range of food including local produce. Special dishes of local seafood and our very popular "scotch and scallops" famous seafood chowder. We cater for groups and bus loads by arrangement.